Share the excitement of the K&ESR with someone special! Whatever your budget, there is sure to be a suitable K&ESR Gift Card available. Our Gift Cards can be redeemed in our shops at Tenterden and Bodiam, at any of our Booking Offices against train tickets, for lunch or dinner on the Wealden Pullman dining train or our range of Railway Experiences. They can even be used to join the K&ESR supporting charity! Your Gift Card will be mounted in a K&ESR Pressentation Card - with ample room for you to add your special message within - perfect! Once purchased, you will receive an email confirmation and the Presentation Card containing your Gift Card will be promptly sent to the address given at the time of purchase. 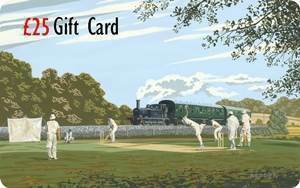 Gift Cards may be redeemed by telephone, at any Booking Office or Tenterden Station Shop. Gift Cards cannot currently be redeemed online nor on-board trains. Copyright © 2000 - 2019 Kent & East Sussex Railway Co Ltd.